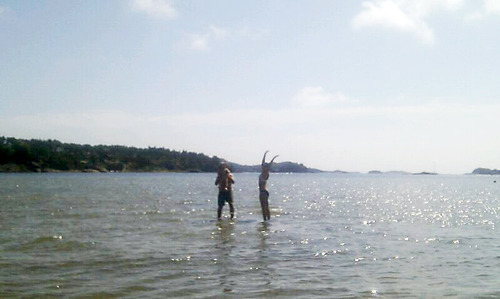 Against all odds, summer came to Norway. I even went for a dip. I discovered my previously unknown mummy-skills in the South. Miss my pretend-nephew. And his fab mum. And her hubby. Maybe I should just move in with them. I left my uninsured iPhone on the bus and only realised it half a bottle of white later. Bought new phone. Maxed out credit card. Economy in shreds, once again. In a moment of weakness, I considered breaking up with journalism forever. I also considered moving to Dubai. Oslo. New York. Kristiansand. A strange man offered me a job in exchange for a tango session. I figured it sounded slightly odd and declined. Nicely. Went for a shop without noticing the ridiculous prices. I’ve been here for too long. I read two books. Tried to get a tan. Edited my CV. Made a new friend. Spent days and nights in envy of everyone on holiday. Went to work. In other words, massively exciting month.